Our Multifamily world is changing. And continues to change. 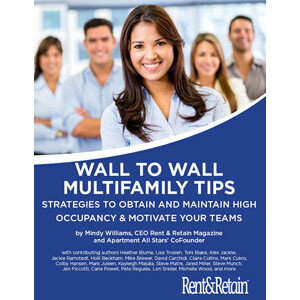 In this jam-packed book, Mindy Williams and her panel of experts take their 20+ years of sales & customer experience and show you the sales ideas, methods and techniques used by top multifamily marketing experts across the county. 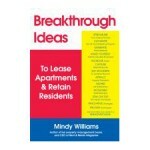 This book is a compilation of strategies from proven sales and resident retention professionals who reveal hundreds of techniques that are crucial for successfully increasing your occupancy. But most importantly, this book emphasizes the importance of self-development and leadership as key steps in improving your life in general — in and out of the workplace. The majority of ideas were published in the last two years of Rent & Retain Magazine and are now compiled in applicable sections (Leasing, Social Media, Leadership, Best Practices, etc.). Take a chance on this book and you’ll find this is one of the best Property Management books you’ll ever get your hands on. 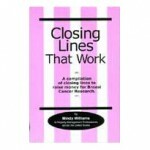 This is a FANTASTIC gift for your team members. A hefty portion of the profits will go to NAAEI (The National Apartment Association’s Education Institute) and The Ovarian Cancer Research Fund (www.ocrf.org). Unfortunately we cannot issue refunds on eBooks. eBook is available in the following formats: PDF, .mobi (for Kindle and eReaders) and epub.